If you're interested hit me with a note titled "commission". If you'd rather discuss about this via e-mail, I can send my e-mail address to you privately. All payments are PayPal ONLY, I'll send you an invoice. Mie twiittasin tän ilmoituksen jos Twitterin kautta löytyisi kiinnostuneita ostajia. Ite heitän noottia heti kun saan rahaa peipälliin. Extra expressions for example can be one of these or anything else you want! Make sure to read the TOS please! Keep in mind that I don't always work in chronological order!! Commissions are open!! I feel way better than in the last few months now! I've been so worned out because of my last job that I had no motivation for my drawings at all. But now, I am feeling super good , I quit the other job and I now have a job that is way better for my mental health ;v;!! Woiiiii !!! I now send invoices as payment for paypal! SORRY I DON'T RESERVE SLOTS WHEN COMMISSIONS STATUS IS CLOSED! Welcome to my commissions’ price list guide! Please read carefully the notes and disclaimers before ordering a commission, but if you have any doubt, don’t hesitate to contact me! With the exception of Covers for books, CDs, etc, note that these prices are considered for PERSONAL USE and up to A4 size. Description of Character: (Poses, Expressions, Eyes/Hair color, a brief of personality and back story, ect...) References are ABSOLUTELY needed, the more details (in photos, references not WORDS), the better. special effects or extra details. Since I have to work on many projects, please keep the informations enough and short, filled with the references, photos you can find. I cannot read all of your characters descriptions in all words. If you cannot find the right references, then I will do everything following what I imagine in my head. Please respect the artist's style. I accept both Paypal and Points now!! Please note me for details on either payment choice! I'm very flexible and can work things out with you. You can choose between Original Roly Poly Chibi, Fairy Chibi, and Itty-bit Chibi! There are things I'm willing to draw, like.. COMMISSIONS :)Hi everyone, I do commissions ! 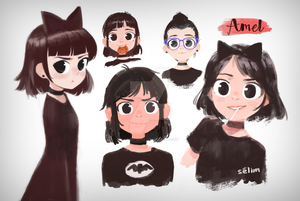 • antro or furries except animal ears and tails. HEY, HEY! It's time for commissions! Like, for real now. This time there's only three slots now since I may have to do some other things this summer (and I'm going away for the weekend, but able to do commissions otherwise). But yeah -- STILL OPEN! Please do take a look on the commission info which is right after the price list. $30 regular chibi commissions [CLOSED] please note me if interested! i do also draw males and anthro/furry!